Krista leverages significant experience in program and project management in many different industries on behalf of Harmony Technology Services clients. Whether in healthcare, agriculture defense or software development, Krista has personally managed projects as well as teams of professionals to break through organizational silos, fix and enhance business processes and provide bulletproof change documentation. 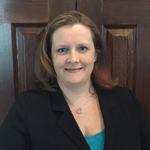 In addition to her resource and supply chain skills, Krista is a recognized Project Management Professional (PMP) and holds several technical certifications. Advisory Services Manager for Ernst & Young, providing guidance on IT risk assurance, transformation and risk management. As an Enterprise Asset Supervisor at Northrop Grumman, Krista managed teams that were responsible for over 8,000 different software applications, 100,000 hardware assets, and generated $20 million in savings to the enterprise through process and tool improvements. When not leading projects and teams in the workplace, Krista has her own “home team” of minions with two kids, three dogs and her husband.